Before I tell you the young man’s response I want to say that promises lie at the heart of much human interaction and relationships. We make promises in marriage, in families, and in our work. Promises are the foundation of many of our commitments and motivate many of our actions. More importantly, promises lie at the heart of our faith and our relationship to God. God has given many wonderful promises in His Word and the essence of our faith is that we trust in the promises of God and the God of the promises. It is in claiming His promises we are saved. These days, a lot of people don’t keep their promises. In this world of foiled plans, broken dreams, and unkept promises people need the knowledge that our God is a God who makes and keeps great promises and those promises are for all who believe. He promises refuge, strength, peace, joy, and—above all—an eternal relationship with Himself. 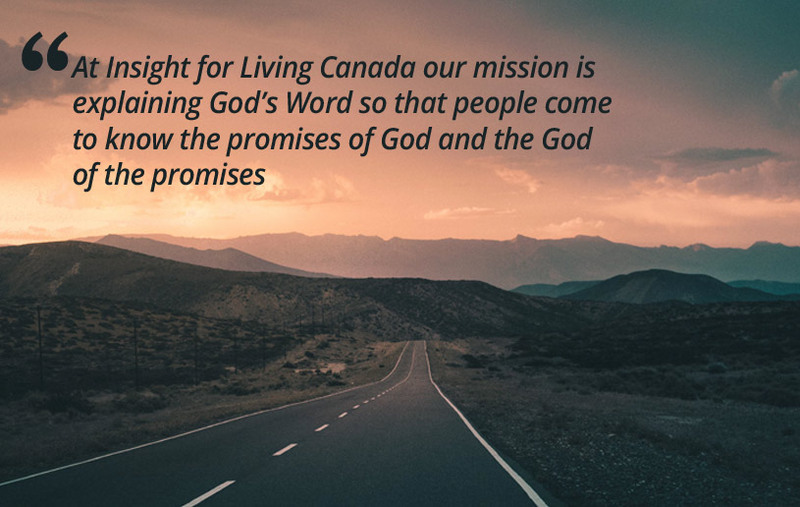 At Insight for Living Canada our mission is explaining God’s Word so that people come to know the promises of God and the God of the promises. We want to help people “make every effort to respond to God’s promises” (2 Peter 1:5) because it is essential for their salvation and growth as believers. This is why what we do is so important and why we need your continued support. As we move toward the Christmas season we are reminded again that the birth of Jesus was the fulfilment of many of God’s promises to send a Saviour into the world. The birth of Jesus Christ was part of the fulfilment of the salvation God promised when humanity fell into sin (Genesis 3:15). When life was at its darkest God’s promise gave hope. When responded to in faith, God's promise brought life. The birth of Christ is proof God keeps His Word. Life is still dark for many. But God’s promises still bring hope and life today as we proclaim them in print, on air, and online across our country. Can we count on your support this month as we share God’s promises of hope and life? I’m glad we don’t have to swim a pool of alligators to claim God’s promises. And sharing them with others is as easy as sending a gift to Insight for Living Canada today. PS God always keeps His promises. Send your gift today to get that great truth out to where it is needed.